So, a few years back (prior to getting my real estate license) I used to bowl in leagues a little bit. I had heard that King Pinz had opened in the Villages of Leesburg (near Wegmans) on June 8th, but hadn’t been by to see it. I was in the neighborhood at Potomac River Running, so I dropped in to see what the fuss was about…The picture above, snapped with my cell phone, certainly doesn’t do the place justice at all! 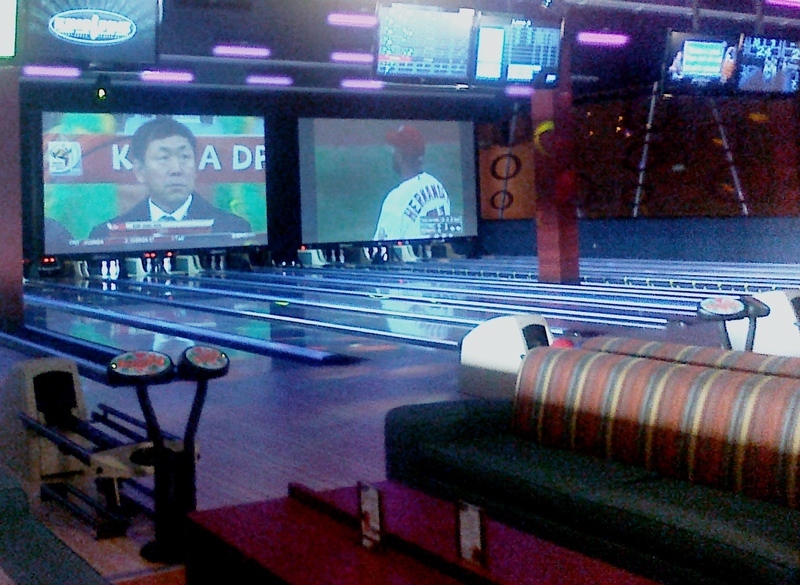 There are three huge big screen tvs over the lanes, plus a bar area with pool table and booths, and an arcade. A four lane VIP area can be reserved for parties, too. Take a peek at the website to see what types of specials they have; Wednesday night is home to a young professionals social networking event. They also take reservations in advance, so you don’t have to wait for a lane to open up. When we stopped by we were told there were not currently any leagues set up, but that may change in the near future if there are enough folks interested. It’s a nice place, but if you are looking for a family venue (2 games + dinner/drink & arcade) make sure your wallet is packed. For us (family of 5) we nearly hit $250 for all the above so make sure to ask about the per-person rates and add it all up – else you will have sticker shock as we did!